Considered to be the most celebrated diamond in the Iranian Crown Jewels and one of the oldest known to man, the 186-carat Darya-i-Nur is a crudely fashioned stone measuring 41.40 × 29.50 × 12.15 mm. The name means Sea of Light, River of Light, or Ocean of Light. It is a table or 'taviz' cut diamond. Both the Darya-i-Nur and the historic Koh-i-Noor are said to have been in the possession of the first Mogul emperor of India, from whom they descended to Mohammed Shah. When the latter was defeated by Persia's Nadir Shah during the sack of Delhi in 1739, he surrended all his chief valuables, including the diamonds and the well-known Peacock Throne. After Nadir's assassination in 1741, he Darya-i-Nur was inherited by his grandson, Shah Rokh. Later, it descended in succession to Mirza-Alam Khan Khozeime and thence to Mohammed Hassan Khan Qajar. Finally, it came into the possession of Lotf-Ali Khan Zand, who was defeated by Aga Mohammed Khan Khan Qajar. In 1797, Aga Mohammed was succeeded by his grandson, Fath Ali Shah, who was both a collector and connosseur of gems and whose name is engraved on one side of the great diamond. In 1827, Sir John Malcolm, a British emissary to the Persian Court and author of Sketches of Persia, described the Darya-i-Nur and the Taj-e-Mah (another famous diamond in the Persian Regalia) as the principal stones in a pair of bracelets valued at one million pounds sterling. 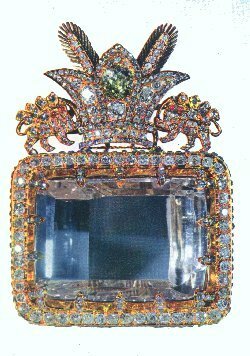 During the reign of the next shah, Nasser-ed-Din (1831-1896), the stone was mounted in an elaborate frame, which is surmounted by the Lion and Sun (the emblem of the Imperial Government of Iran) and set with four hundred fifty-seven diamonds and four rubies. It is still mounted in that same frame today. 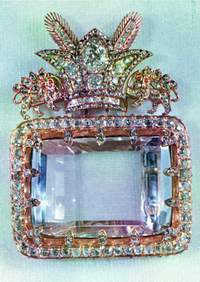 Although some researchers contend that the Darya-i-Nur was acquired by the East India Co. and exhibited at London's Crystal Palace Exhibition in 1851, Iranian officials at the Central Bank of Iran in Tehran, where the Crown Jewels are kept, told the Gemological Institute of America in 1964 that it has never left the Treasure Vaults. In 1906, Mohammed Ali Shah, after being defeated by the Constitutionalists while carrying the diamond and other valuables with him during the Persian Revolution, took refuge in the Russian Legation and claimed that the jewels were his personal property. However, as a result of intense efforts made by the freedom fighters, this priceless token of Nadir's conquests was restored to the country. Today, the Darya-i-Nur holds a prominent place amoung the Iranian Crown Jewels. The Iranian Crown Jewels were studied and authenticated in 1966 by Dr. V.B. Meen of the Royal Ontario Museum. It is now believed that the Darya-i-Nur is the major portion of Tavernier's Great Table. Source: Diamonds - Famous, Notable and Unique by GIA. It should be noted that the exact weight of the Darya-i-Nur is not really known. The figure of 186 carats listed here by GIA is an estimate. The stone is estimated to weigh somewhere between 175 and 195 carats, and it is a light pink color. The reason the exact weight is not known is because the stone cannot be removed from its setting without major risk of destroying the setting. It is more than likely that the stone was cut from the Great Table Diamond, and stone that was described by Jean Baptiste Tavernier as being over 400 carats, pink, and very flat.